Apparently it all caught up to me and I have the pleasure of being stuck in bed sick. Ugh too much going on = one physically stressed out Jes, apparently. But I’m sure you’re not interested in my oh-so-delicious orange Gatorade & blueberry Greek yogurt (Total Greek being my fave at the moment), so I’m going to take another blast to the past to Atlanta, the city I love and miss oh so dearly. While in Atlanta, one needs something beyond simply sustenance–one also needs drinks. And where are two of my favorite places to grab a brew or two? The Marlay House & Young Augustine’s of course! 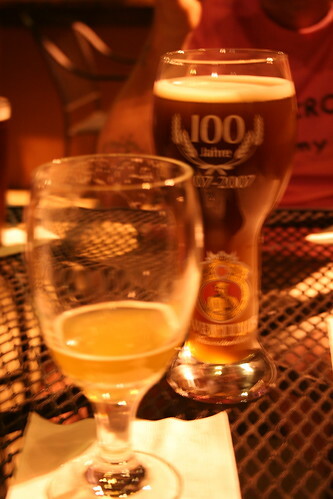 Both have different draws for me, but both boast amazing outdoor patios and a beer list to die for. The Marley (nee The Grange) is located in Decatur and has been, since it’s opening a few years ago, one of my favorite hangouts, especially during the summer. Given that the owner is involved in the cycling community, it’s a great place to grab a pint and watch the Tour de France or other road races during the summer, hang out with your friends, and get a bite to eat. 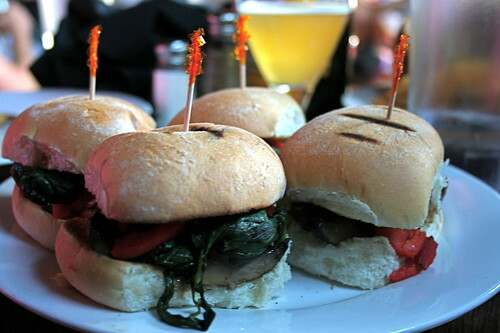 And while you wouldn’t think that an Irish pub would be vegan friendly, there are always a few great options, including the portobello sliders pictured above. And their fries? Super good too. With 20 beers on draft, a new cask or two opened every week, and a bottle list to boot, no other pub to-date has met my need for a good, solid neighborhood hangout. One of my other favorites is Young Augustine’s, located in Grant Park off of Memorial Drive. Formerly The Standard, a bar hit by tragedy in January 2009 with the murder of bartender John Henderson, Young Augustine’s is another favorite–if only for the amazing gastropub food, the intense beer list, and the perfect city-vibe you’ll get on a warm summer/spring evening on the patio. Their roasted mushroom sandwiches and several apps can be made vegan, and as far as the beers go? Well, I can always find a new one there I’ve never had before. While The Marley is my daytime haunt, Young Augustine’s takes the night spot for me, with Memorial Drive’s traffic, the Bank of America building lit in the distance, and Marta all within view. Oh yum! I’ve never been to either of these places. They’re on my list now. You have some great Atlanta flashbacks – it sure looks like it’s worth a visit. I love a good beer list! Funny. I had plans for portobello burgers last night with homemade buns, but the buns didn’t turn out as I’d hoped – they didn’t rise sufficiently and came out like little mini buns. So we ended up having “sliders” instead. How ironic it was then to visit your blog and see a picture of the very thing! Ah, but even if the buns DID turn out, my burgers weren’t nearly as inspired as those you’ve pictured. What is that, spinach and tomato on top?